Here we are again with another set of Kinkeshi Premium and another review. With 6 sets now, the premium flesh series sits at 90 figures, plus 1 prize figure and the colored variants. Bandai have really been pumping these out and I love it. I know I said Vol. 5 was my favorite so far and that is still true…by a whisker. Between Vol. 5 and Vol. 6 we have 7 of my 10 favorite figures in the entire series! Lets start with what I feel are the best 3 in this set. Iwao – He is one of my favorite M.U.S.C.L.E. figures and this version does not disappoint. In fact I might even like it more than figure #23. The expression on his face and the pose are fantastic, it brings him to life. 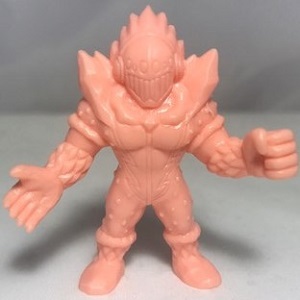 Funny side note is this figure and the M.U.S.C.L.E. figure are in the minority of versions of Iwao I own in that don’t have him with a tail. Bikeman – not a figure that has been released in a lot of series but this version of Bikeman is WAY better than the M.U.S.C.L.E. one, he’s solid, has awesome detail and looks more like a Bikeman should look like, I love him. The Parthenon – Wow, very chunky and intimidating figure. I don’t own the 1991 Kinkeshi of this guy but this figure reminds me of that one. It is certainly a standout. 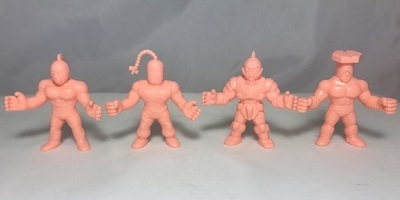 There seems to be 3 figures in each volume of Kinkeshi Premium that seem to be a bit larger than life. The boxes they come in also reflect that with 3 bigger spaces for figures. This figure is an obvious choice. The Samurai – this guy might not be known to M.U.S.C.L.E. collectors and therefore may be thought of as a new sculpt. He isn’t. This is essentially Neptuneman in a different outfit, there are also Kinnikuman Part 30 and Romando versions of this figure. I’m not sure where the Samurai name comes from as this doesn’t look like what I pictured to be Samurai getup. 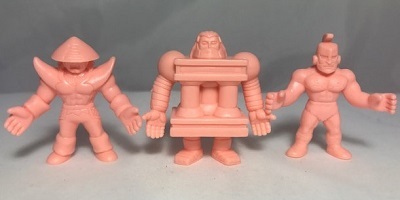 Kendaman – Good version of this figure, similar to M.U.S.C.L.E. figure #230. I can see Bandai doing another version of this figure. Screw Kid – He is what you would expect, no screws for hands. A reproduction of a figure already done. Akuma Shogun – For those counting this is the 4th Akuma Shogun in the 6 volumes. What is up with this guy? This one is very different to the others at least with having Sunshine’s arms and 1 of Junkman’s hands. It’s okay, not as good as the Vol. 5 figure. 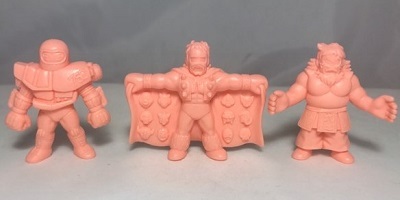 Kinnikuman in armour – Every set has a version of Kinnikuman. This one has him in the armour, similar to Kinkeshi Part 29. That seems to be a bit of a them this volume, late part Kinkeshi. 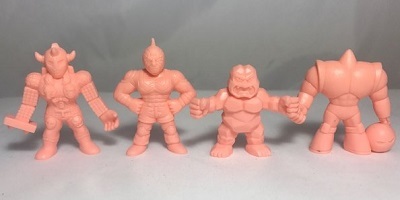 Kinnikuman Zebra – Bit disappointed in this one. I had to look close to see it was Zebra, he also seems a bit skinny. Lastly, this Volume only contained 1 completely new sculpt – again I don’t know the name but he looks pretty darn cool! The mask and hairstyle combined with the wrestling suit he’s wearing give him a great look. He would actually be in my top 5 for the completely new sculpts. 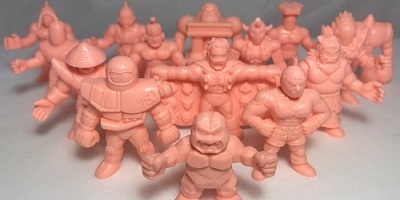 Back next week to look at a M.U.S.C.L.E. favorite that has now been re-released by Bandai. This entry was posted on Monday, June 11th, 2018 and is filed under UofM News. You can follow any responses to this entry through RSS 2.0. You can skip to the end and leave a response. Pinging is currently not allowed.